Crestliner Pro Charlie Wray has been fishing from a Crestliner his entire career. Over 35 years, Wray has won 10 major fishing awards in Ontario. Three of those five years he was awarded Top Angler, and he has been recognized as one of Canada’s top fisherman. After competing on the pro circuit, Wray took his talents in front of the camera and now hosts the popular fishing show, Fishful Thinking. But before he got his start in the pros, he learned to fish with his dad on the lakes of Central Ontario hunting for elusive muskies. We caught up with Charlie and asked him to explain what the time spent fishing with his dad meant to him growing up. 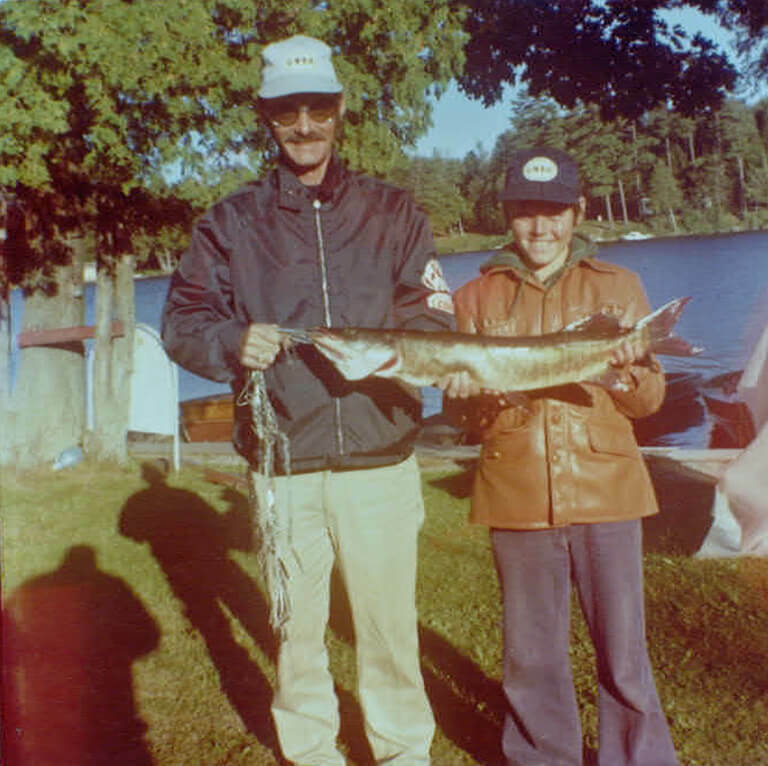 A memory that will live forever is the summers I spent with my dad fishing and camping in the Kawartha Lakes of Central Ontario when I was quite young. My father learned early on that I had a unique love for fishing and loved spending time on the water, even if the fishing was slow. I loved just being in the boat. Each season we spent long winters planning the next summer and our entire year seemed to revolve around our summer trips. My father worked overtime and banked all his days off to put towards our summers on the water. Reading as much as I could about fishing, the mighty Muskie was always the prize. It was the fish of legends, almost a mythical creature that was referred to as the fish of 10,000 casts and some people go their entire lives without catching one. We knew Muskies were in these waters and the stories of the one that got away often gave this fish even more of a legendary status. My first Muskie is one I will never forget, a jolting strike, a leap, and the fish buried in the weeds so thick we were sure it was gone. I remember us turning and driving the boat back to where the fish hit. My dad slowly pulled on the line, lifting ever so carefully, then netted a massive pile of weeds. With a shake that threw a spray everywhere, my first legal-sized Muskie revealed itself, safely in the net. There is a common symptom amongst diehard anglers called a Muskie shake, an uncontrollable shake that buckles the knees like someone that won the lottery. Yes I remember it well. I have caught my share of Muskies since, and some real giants, but never one so memorable. My summers with my father embraced my love of fishing, and I have been able to make a living doing what I truly love. After 27 years of filming the Fishful Thinking TV Show, the love of fishing is still going strong. Who would have dreamt that these memorable summers would have led to a career in fishing? Thank you Dad, the memories will never be forgotten. Happy Father’s Day.